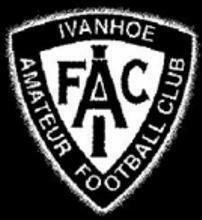 IN the 77 years (1934 to 2011) since Ivanhoe joined the Amateurs, the seniors have competed in 29 finals series, including 14 grand finals. The greatest era was in the first three seasons after we joined the VAFA in 1934. The Hoes won three flags in a row and were undefeated in 60 games. It’s a record that has never been equalled in the VAFA, and possibly in the game’s history. 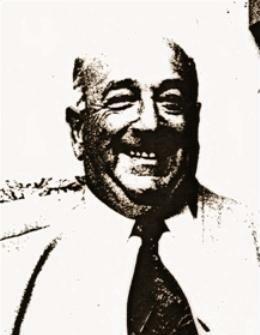 Ron Smith at full-forward topped the competition goalkicking in C and B grades in 1935 and 1936. Smith kicked 360 goals in those first three seasons in the VAFA. He played until 1949, amassing over 1000 goals, and became the club’s first life member. The club’s goalkicking medal is named in his honour. Another early legend was Allan Killigrew, who played in the 1935 flag and went on to play at St Kilda, before coaching North Melbourne and Victoria. Those first few seasons helped create an aura of success around the club that remained for decades. The club was always either in A or B grade until the late 1980s. The 1950s were a golden era for Ivanhoe. The club reached the pinnacle of success in 1956, securing our first and only A grade premiership. 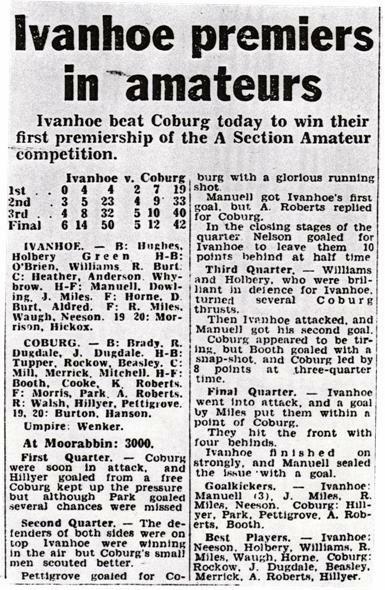 On Saturday Setember 15, Ivanhoe defeated Coburg, 6.14 to 5.12. The Sporting Globe (right) reported the win that night. The only other times the club has played in A grade finals were in 1947 (third) and 1978 (fourth). Other highlights of the 1950s included the 1954 B grade flag, and being runner-up in the 1952 B grade grand final. Ivanhoe defeated the State Bank in 1954, 10.10 to 4.11. The under 19s also won flags in 1953 and 1955, and were runners-up in 1957. The club song, sung to the tune of Jingle Bells, was penned in 1952 by an under 19s player Barry Jeffrey. 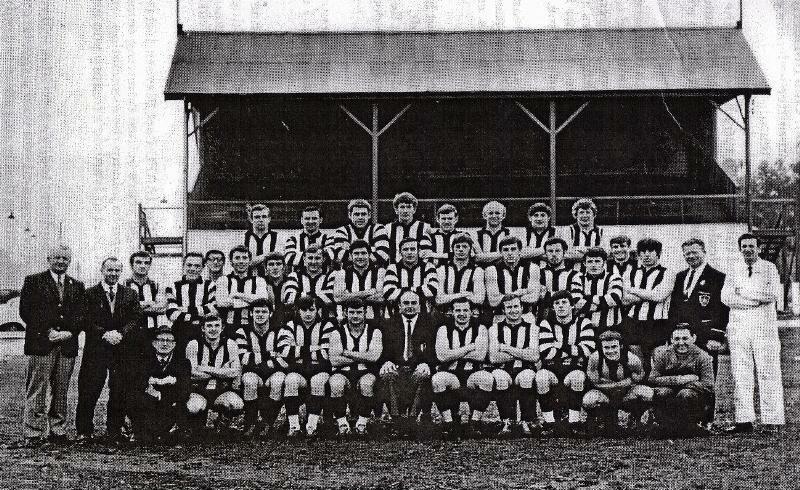 The 1969 B grade premiership team in front of the former Ivanhoe clubrooms. We had great rivalries with fellow district clubs Ormond, Kew and Coburg during the 1950s, 1960s, and 1970s. The club’s last senior premiership was in B grade in 1969, when De La Salle old boys was defeated by 21 points, 13.15 to 10.12. The club made the finals six times during 1970s. The 1972 B grade grand final was lost to Geelong Amateurs, 16.13 to 8.15, and the 1977 B grade grand final was won by by Old Scotch 13.22 to 7.16. Ivanhoe was in the A grade semi-finals in 1978. The 1980s saw the rise of old boys clubs. Some of Ivanhoe’s toughest battles were with St Bernards, Old Paradians, Collegians and Old Melburnians. The Hoes lost two B grade grand finals in the 1980s. In 1982, Old Melburnians won by 13 points, 18.7 to 15.12. In 1984, St Bernard’s won by 18 points, 20.13 to 17.13. In the early 1990s, Ivanhoe was a finals regular in C grade. There were also great local derbies with Old Ivanhoe, Banyule and Bulleen-Templestowe. But the ultimate success proved as elusive as ever. And there were also growing concerns about an inability to field an under 19s side, which could provide a stepping stone from juniors to seniors. The club was unable to field an under 19s after 1993. Two years later a hybrid under 19s team was formed with Banyule, called the Warringal Redbacks, which lost a grand final to St Kevins by 3 points in White section in 1996. The Redbacks survived a few seasons until poaching became a problem. Former Collingwood and Ivanhoe player Doug Gott coached the club to the 1995 C grade grand final, which Old Ivanhoe won by 29 points, 15.12 to 10.13. The club was promoted to B grade, and finished fifth in 1996. Gott was replaced as coach by former Preston and Reservoir player Doni Valkanis (pictured left) in 1997. 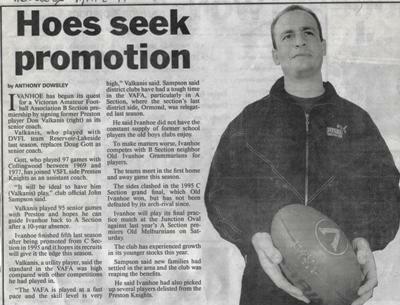 The VAFA refused to grant Valkanis a playing permit that year. The club finished fifth despite a brilliant second half of the season. Relegated to C grade after a poor 1998 season, the club searched for answers. Poor player numbers, the lack of an under 19s side, and the increasing dominance of old boys clubs were identified as key areas of concern.